Home Arts Odysseo, it really is an amazing show! Odysseo, it really is an amazing show! You’ve probably driven by the big white tent at South Towne Mall and seen the billboards advertising Odyesso long before it opened to the public in Utah last week. And the question on everyone’s mind is: is it worth the hype? Attending Odysseo on opening night with approximately 2,000 other spectators, I was pleasantly surprised and entertained for the entire two hours. Odysseo is currently the world’s largest touring production, created by Normand Latourelle, one of the co-founders of Cirque du Soleil. Odyesso made its world premiere in 2011 in Montreal and has since traveled throughout Canada, the United States and Mexico. A spectacle like no other, the show brings together 65 horses and 48 artists including riders, acrobats and aerialists who perform riveting stunts under the largest big top tent currently traveling the world. 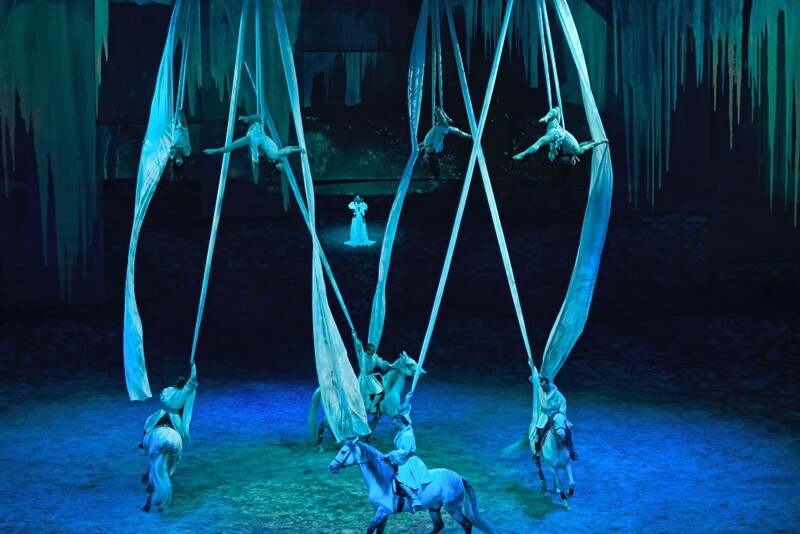 Produced by the entertainment venture Cavalia Inc., Odysseo’s special features will leave you wanting more while the horses add a dimension to the live performance that is beyond impressive. 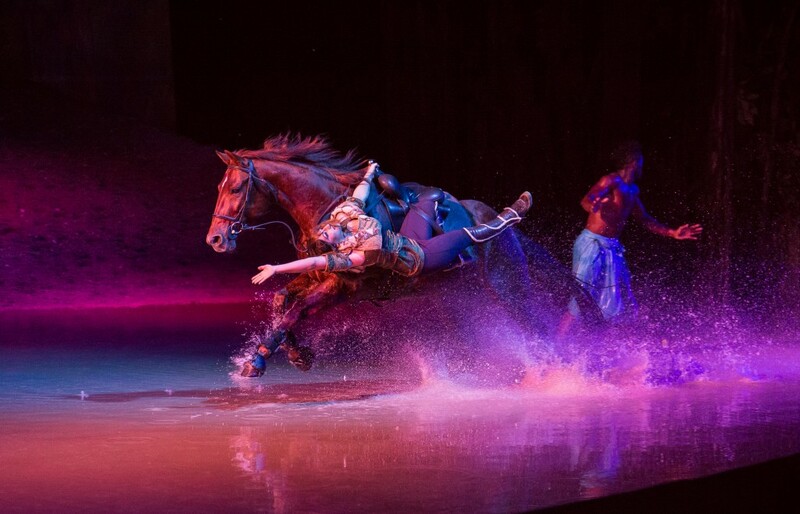 Even if you’re not a horse lover, it’s easy to grow fond of them after seeing them prance, run and jump in this show. Live performances of both musicians and vocalists, along with the mystical movements of horse and man, created a very unique sensory experience. The show takes the audience on a visual journey that begins in an enchanted forest to the Mongolian steppes to Monument Valley. It continues on to the African savannah and the Nordic glaciers, to the Sahara and Easter Island and then culminates with a lunar landscape and a real lake created from 40,000 gallons of recycled water. Perhaps the show’s least impressive stunt, the lake was still very beautiful. The mystical, graceful and calculated movements of the aerialists left me on the edge of my seat as they seemed to float in mid air. Several acrobats from West Africa wowed the audience with human pyramids of raw strength and endurance when they weren’t crossing the stage at high speed with round-offs, back flips and tribal dancing. In addition, they sang and chanted–even involving the audience in one part–chanting the phase ‘No more war on earth’ in Susu, their native language. The show has had such a positive response that Cavalia has extended its time in Utah through May 15. Tickets range in price depending on day and time from $39.50 to $259.50. Special pricing and packages are available for families, groups and children (2-12), juniors (13-17) and seniors (65+).